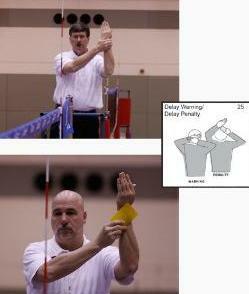 Volleyball referee signal techniques for USA/FIVB volleyball officials. Only the first referee can sanction a team or individual. However, the second referee may request a sanction and the first referee should honor that request. As a second referee, you should discuss your method for sanctioning before the start of the match. As a first referee when you are sanctioning a team or player, remember to blow the whistle and get everyone's attention. 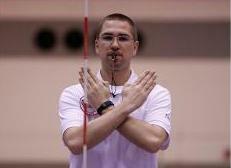 Next, show the appropriate volleyball referee signal. Remember, for a penalty sanction, signal the next team to serve first before showing the card. Hold up card/cards in the hand on the side of the team member being sanctioned. Avoid "pushing" the card at the individual. The R2 doesn't repeat the hand signal. For a delay sanction, hold hand against the opposite wrist on the side being sanctioned. This is for a delay warning. For a delay penalty, place a yellow card against the opposite wrist on the side being sanctioned. Remember, for a penalty, first show the point signal. The R2 doesn't repeat any of the signals. Substitutions and time outs are usually the responsibility of the second referee. 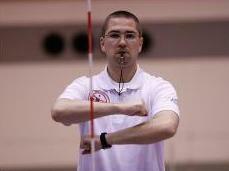 When the request is recognized by the second referee, the first referee mimics the signal. 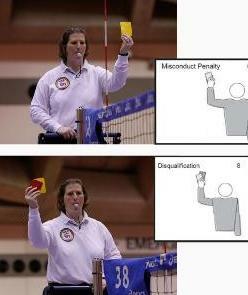 When the second referee doesn't recognize the request, the first referee may blow the whistle and initiate the volleyball referee signal. When a sub enters the substitution zone, this constitutes a formal request for substitution. The whistle is blown, usually by the second referee to recognize the request. Signal by rotating the forearms with hands closed. Rotate in a circular motion, one around the other in front of your chest. Only use one or two rotations. The first referee repeats the substitution signal. 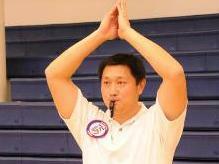 After making the substitution hand signal as a second referee, make a signal for the player to enter the court. This is done only after players have made eye contact with you. Extend the arm and at thigh level, make a forward sweeping motion with the palm facing forward. The first referee doesn't repeat this signal. When a team requests a time out, the second referee, or first referee if necessary, whistles and then places the palm of one hand over the other hand in a vertical position to form a "T". The vertical hand/arm is on the side of the team making the request. 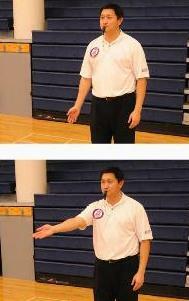 After signaling, the second referee will extend the vertical arm toward the bench with an open hand. This indicates the team taking the time out. The first referee will point across the court to the team bench with an open hand. 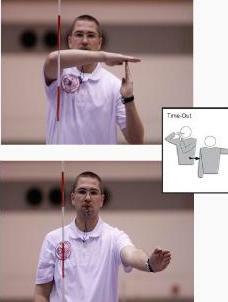 After the last point of the set has been scored, and you have awarded the final point and signaled the fault, whistle and show the end of set signal by crossing the arms over the chest. Hands should be open with the palms facing the body. 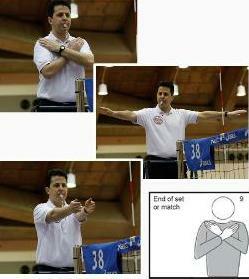 At the end of each non-deciding set, show the change of courts volleyball referee signal. With closed fists, place your left arm in front of your body and your right arm behind you. Twist your arms around your body once in a counterclockwise movement. 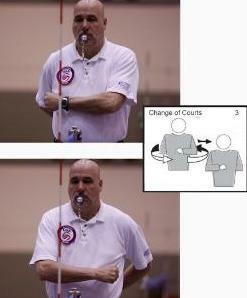 Also use this signal for a court switch at 8 points in a deciding set. At the end of the match, direct the teams to the endlines without whistling. Extend your arms with hands open. The volleyball referee signal for an illegal contact in coed play is to bring your hands together up over head with palms together. Signals are your "voice" with participants and fans. Signals help drive first impressions. Getting signals right takes a lot of work, but there's no reason why a referee can't have great signals.